In the spirit of Arts Week, I thought I would share my recent installation in Richmond with our community. I am so excited to see this piece complete! In November 2018, I was selected as a featured artist in the Capture Photography Festival, which takes place this spring and summer at locations around the city. I was selected as a Musqueam artist and presence within the festival. Because this is a photography festival, I had to incorporate some element of photography or photographs within my piece. I am no photographer, but wanted to do something that incorporated my family and my culture. 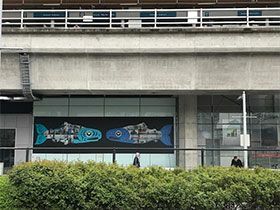 So, within the painted salmon bodies, I embedded collages of family fishing photos, which feature my grandfather, father, aunts, uncles, cousins and me fishing on the Fraser River. 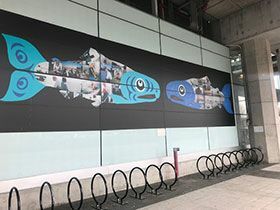 As Musqueam, we are taught that salmon are sacred. They are considered to be relatives who sacrificed themselves so that we may survive. They are a symbol of abundance, prosperity and wealth. They are our livelihood. Fishing season in Musqueam is a family affair. If you ask anyone in our community of their fondest childhood memories, of those that connect them to their family and ancestors, many will tell you fishing stories. As a community and First Nation, Musqueam has always practiced strong teachings. We have lived here and fished salmon from the Fraser River since time immemorial. This knowledge continues to be passed on through families to our future generations. Many non-Indigenous residents of Richmond are unaware of our history here. 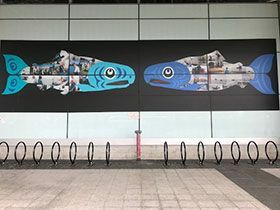 It is important for everyone to know that this city sits on the traditional, ancestral and unceded territories of the Musqueam people. We had summer fishing villages located in what is now Richmond, along the river. My surname, Point, is connected to the colonial place names across Richmond and the Lower Mainland. As sentinels, Musqueam people were responsible for oversight of headlands, places now known by the names Point Roberts, Garry Point and Point Grey. We say that is why the Catholic priests gave my ancestor's the surname “Point.” This history connects me not only to my ancestors but also to this place. 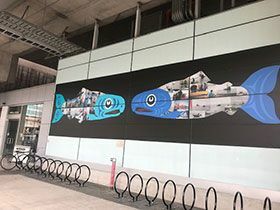 The installation is located at the Richmond Brighouse Canada Line station, directly across the street from Richmond Centre Mall. It will be there all summer and likely taken down in October. I’m very excited about this and how it has come together since the first initial planning stages last fall.